Under-Reporting of War Deaths – or Genocide? The estimates of numbers killed in this terrible war have varied from website to website. On the 31stJuly FARS news agency reported the number killed as 5313 people, most of them women and children. Al Jazeera quoted UN statistics on 27th July, stating that 3,640 have died altogether, about half of them civilians deaths. I believe both of these numbers hide the truth, and the number of those who have died is much, much higher. Then there is the nature of Yemen itself. In rural mountainous areas Yemeni families bury the deceased in their own villages, and with the ongoing conflict there is no system for these deaths to be immediately recorded. In some areas, especially the north-west, villages are inside conflict zones and not excluded from serious effects of warfare. The lack of fuel also means that moving injured to hospital is a challenge, for example, a recent report from journalist Mathieu Aikins “Yemen’s Hidden War” published by Rollingstone, stated that whilst he was in Yemen injured people were bought into a hospital in Saada from a village – he pointed to the difficulties in getting the casualties to hospital, with little petrol available, and for many the cost prohibits access to petrol. Apart from the blockade by Saudi Arabia, 180 petrol stations have been bombed in Saada area. For those few who manage to get their injured loved ones to hospital, inevitably many others will have failed and the injured may have died from lack of medical care. Dr. Natalie Roberts saw food trucks that were recently bombed in Amran district, destroying desperately needed food. 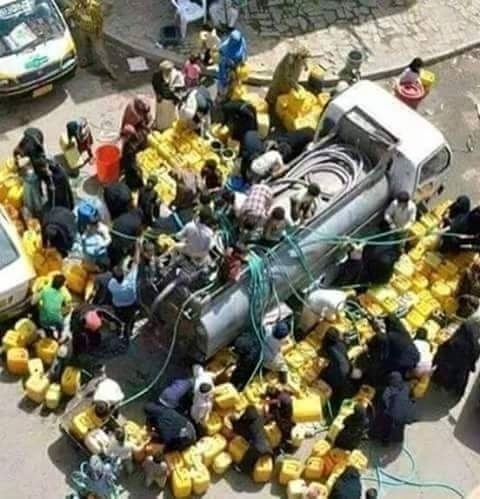 Sources reporting the humanitarian situation in Yemen point to the precarious water supply. Yemen, already short of water, has now moved into an era of critical water shortage since the beginning of war. On 26th May Oxfam reported that two thirds of people in Yemen no longer had access to clean water, and expected that this would cause deaths fromwater borne diseases. The situation has worsened since then, as some water tanks have suffered bomb damage, and the petrol needed to pump water from deep wells is in even shorter supply. Another problem is a lack of baby milk. It was reported from Yemen sources recently that only 11.9% of Yemeni women are able to exclusively breast feed, a significant fall since last year. The shortage of water, shortage of food and ongoing stress will make it more difficult for women to produce sufficient milk for their babies. The reduction in breast feeding is life threatening for Yemeni babies, especially when it is combined with low availability of milk powders, unclean water supplies, and shortage of fuel to boil water for sterilisation purposes. The Saudis are particularly targeting the Zaidi population in the northwest of Yemen, destroying homes, schools, petrol stations, hospitals, roads, factories, shops, mosques, historical artefacts, a refugee camp and vehicles. Although it was reported that those in Saada were given notice that their homes were about to be destroyed by leafleting prior to main bombing raids, the people living there had few choices. Some organisations claim that the bomb damage in the northwest amounts to war crimes. The majority of people in targeted areas lost their homes, belongings, sources of employment, and income. The destruction of their homes destroyed shelter for families in a hot desert region in midsummer; in winter, high mountainous areas can also experience cold conditions and night frosts, making life without shelter challenging all year round. With the loss of their homes, families also lost access to water, electricity, and cooking facilities. 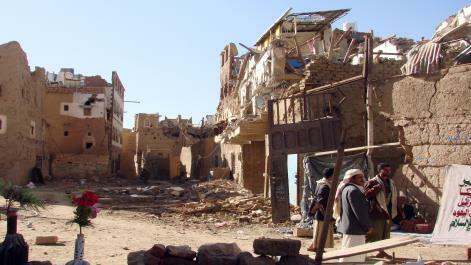 Whilst some of the displaced have moved to the capital Sana’a and other cities, they would not be able to escape to the more stable area of Hadramaut due to their tribal and religious identity, as that area is controlled by extremist Sunni militias with strong anti-Shia sentiments and a fear of Zaidi spies. A large proportion of the displaced from Saada area have remained in the northwest, finding or building temporary shelter with limited resources. Some have formed camps near to the Saudi border, as many have relatives in Jizan and Najran who might offer them sanctuary, but currently I understand they are denied entry into Saudi Arabia, and a wall prevents them from crossing the border. Many that remain in the northwest are now trapped, as the severe shortage of petrol, the high cost of travel by bus, and the targeting of vehicles for air attacks on all local roads means that escape is challenging even if living conditions are life threatening. The low numbers of refugees crossing borders only reflects severe travel restrictions, and does not imply that the conditions in Yemen are better than in other war-torn countries such as Syria. The northwest of Yemen is suffering severe problems with food and water supplies, not only because of the Saudi led blockade that is affecting all of west Yemen, but also because of damage to roads, and targeting of food trucks. 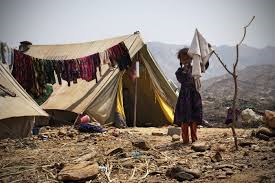 Despite the extensive damage here, the bombing raids continue and like those living all over Yemen the Zaidis are suffering severe stress as they listen to the warplanes circling overhead on a daily, even hourly, basis.